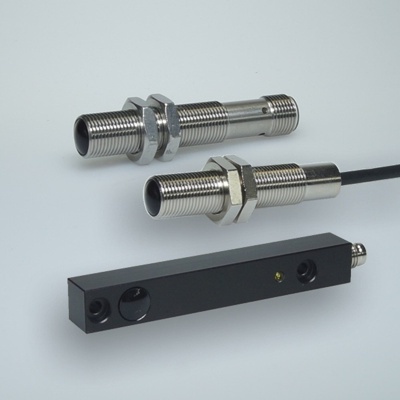 The Compact opto sensor system operates with only one transmitter SLT... and one receiver SLR... in separate housings. No external amplifier is required. This is an open-loop system that may be used in applications where the photoeyes must be wired opposing each other but there can be no wires shared between the two. Both components are supplied with 24V DC separately. The system works with modulated infrared light which provides high immunity to ambient light. The electronic circuits are designed to detect only those signals with the correct frequency and phase relation. This almost completely excludes interference from other light barriers. Thanks to their large aperture angle, they can be easily aligned even at distances of 15 meters. They are insensitive to vibrations, shock and the resulting readjustment. The system can be combined of different transmitters and receivers. The STB transmitter allows a range of up to 40m, the STA transmitter up to 15m. Three receivers are available with different range and switching speed.